Which Tech Brands Can You Trust? PCWorld readers like their iPhones. More survey participants own this model than any other phone, and an unusually high proportion of them praised its durability, ease-of-use, design, and camera quality in our 2011 Reliability and Service survey. HTC phones scored well in those areas, too. But readers had little good to say about LG and Samsung phones, finding fault with their phones' ease of use and with features such as design, touchscreen responsiveness, and overall speed. Highlighted in the first three charts below are our survey participants' ratings of smartphone manufacturers in three general areas: reliability, ease of use, and features. The final two charts focus on cell phone carriers in two critical areas: wireless service quality and customer service. All of these results are drawn from our 2011 Reliability and Service survey of some 63,000 PCWorld readers. The other product categories covered in this survey were desktop PCs, laptop PCs, tablets, HDTVs, printers, and digital cameras. For a closer look at the methodology we used in our survey to gauge manufacturer reliability and customer satisfaction, see "Reliability and Satisfaction: What the Measures Mean." • The percentage of Motorola phone users participating in our survey who reported a problem with their phone has grown from 21.7 percent in 2010 to 31.3 percent in 2011. • Over the past two years, 32.5 percent of Samsung phone owners in our survey say that they have encountered a significant problem with their phone. 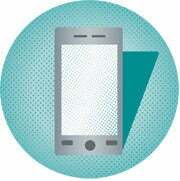 • Satisfaction with battery life varied widely among users of different manufacturers' phones. The vendors that received the highest marks ("extremely satisfied" or "very satisfied") in our survey are as follows (in descending order): Nokia (49.5 percent), Apple (47.1 percent), RIM (45.4 percent), LG (36.6 percent), Samsung (28.9 percent), Motorola (28.6 percent), and HTC (23.1 percent). 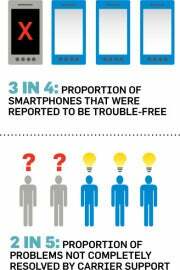 • In the smartphone category as a whole, three out of four phones were trouble-free, according to survey participants. • Among smartphone users who did encounter problems, however, two out of five couldn't resolve their problem through carrier support. • Though satisfaction with the ease of use of smartphones industrywide has improved from 59 percent in our 2009 survey to 63 percent in our 2011 survey, the numbers for RIM's BlackBerry smartphones have actually regressed, from 55 percent in 2009 to 47 percent in 2011. • The most frequently broken or dead components of a smartphone, according to our survey respondents, are (in descending order) the operating system (32.6 percent), the battery 12.3 percent), the touchscreen (12.2 percent), the microphone or speaker (6.1 percent), the GPS device (4.0 percent), Bluetooth (3.7 percent), the physical keyboard (3.3 percent), the display screen (2.8 percent), and the power port (1.9 percent). Two smartphone manufacturers received better-than-average marks for reliability from our survey participants in 2011: Apple collected pluses on all four reliability measures, and LG beat the rest of the field on two of the four ("any significant problem" and "severe problem"). At the other end of the speed dial, three vendors got clocked with subpar scores on three of the four measures: Palm's only saving grace was an average mark for "severe problem"; RIM's best showing was an average mark for "problem on arrival"; and Samsung's high point was an average score for "severe problem." When our readers appraised their phones' ease of use, they once again pointed to Apple as the best-of-breed smartphone manufacturer. On our five ease-of-use measures, the iPhone family earned five better-than-average ratings. The only other vendor with a net positive mark was HTC, which scored better than average on "internet browsing" and "overall ease of use," and didn't trip up on any of the other measures. The only other better-than-average score in our survey was Motorola's for "internet browsing"--but regrettably Motorola's ranking plummeted as a result of worse-than-average marks for "phone setup," "data syncing," and "music/video location and playback." Pushed down, no doubt, by Apple's dominant showing, four companies walked away with negatives on at least three measures and no positives to serve as counterweights: Nokia (three worse-than-average marks), RIM (four), LG (five), and Samsung (five). If it weren't for an average score for "call quality," the iPhone family would have grabbed better-than-average scores across the board on our smartphone features measures; as it is, Apple finished at the upper end on 10 of the 11 criteria. Also finishing in the black overall is HTC which overcame a subpar rating for "battery life" to capture second place, with seven better-than-average marks. The other four better-than-average scores went to Motorola (for "GPS capability" and "operating system"), Nokia (for "battery life"), and RIM (for "battery life") --but multiple negatives torpedoed their overall standing. Scraping bottom on the smartphone features front were Samsung (with seven negatives and no positives) and LG (with eight and none). As elsewhere in the smartphone results, the combination of an extra-large slice of the market and radiant customer reviews for Apple probably makes its rivals--especially toward the lower end--look worse than they really are. Presented with a small population of nationwide mobile phone services, our readers rated one--Verizon--as better than average on both of our surveys service-quality measures ("speed and reliability of mobile broadband" and "reliability and sound quality of voice calls") and one--AT&T--as worse than average. On our service and support measures for carriers, AT&T (for "average in-person service rating") and Verizon (for "overall service rating") notched the only two better-than-average marks. we didn't identify any subpar scores on these measures, indicating that the carriers are tightly bunched in most respects, with no significant laggards on any particular criterion. N/A = Not available (too few responses to rate the company on this measure).